Android Police discovered that version 5.3 of the Google app for Android already allows offline commands. Commands which still work include hardware toggle actions like switching Wi-Fi, Bluetooth or airplane mode on or off, as well as dimming the screen, turning volume up or down, playing music or opening any app. The downside of this news is that the rollout of this feature is limited, probably by region/language. I’ve not been able to get it working at all despite having the newest APK installed on both my current daily drivers. Likewise, Stephen tried and failed to get it working too. If the capability isn’t available on your device, you’ll see the usual ‘something went wrong’ notice, asking you to check your connection. 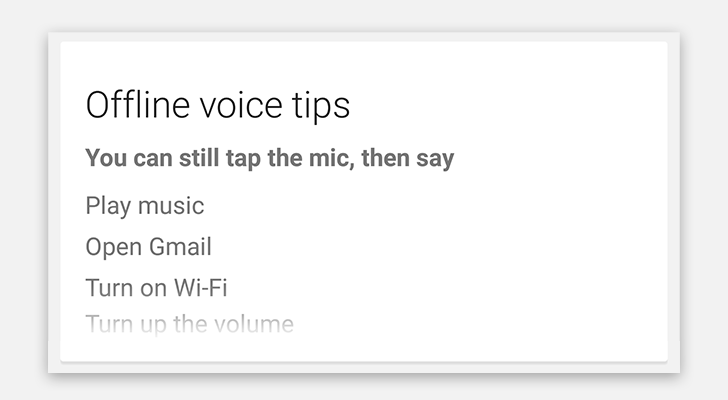 If it is working, you’ll see an ‘offline voice tips’ card beneath the error message. If you want to try it for yourself, or check that it’s available to you, be sure to download the latest Google App APK on to your Android smartphone, then try tapping the mic in the search window with airplane mode switched on. If it doesn’t work, you’ll have to wait patiently like the rest of us eager to test out the awesome new feature. Despite the fact that connectivity is improving constantly, it’s still comforting to know that useful features will still work when you arrive at the inevitable dead zones.